The IQ Science range of technology based toys from IQ Builders allow children to understand how very basic electronic circuits work, fuelling their imagination and their inquisitive nature. 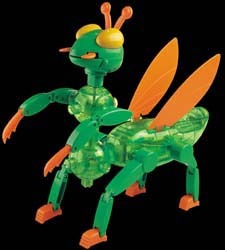 The Bug Builder toy is aimed at the 5+ age range. This colourful animated bug construction set allows children to construct a number of bugs including a preying mantis and a grasshopper. Once constructed the bug can walk, flap its wings, move its pincers, move its jaw and move its eyes - depending on which model is being constructed. This range had totally escaped me until the Bug Builder turned up at our offices. And that is a shame. More work needs to be done - in schools if necessary - to ensure that this range gets maximum publicity. They are well constructed and teach children the basic principles behind gears, motors, electric circuits and energy conversion. When I was a kid I used to smash open my toys to find out how they worked - who didn't. With this range children won't have to. They'll already know how it works as they built it in the first place. This will keep intelligent kids amused for hours. The only real fault I can find with this is that it wasn't launched 20 years ago when I was growing up.